This might be our shortest post ever. It’s a simple little tip to make you go DUH! 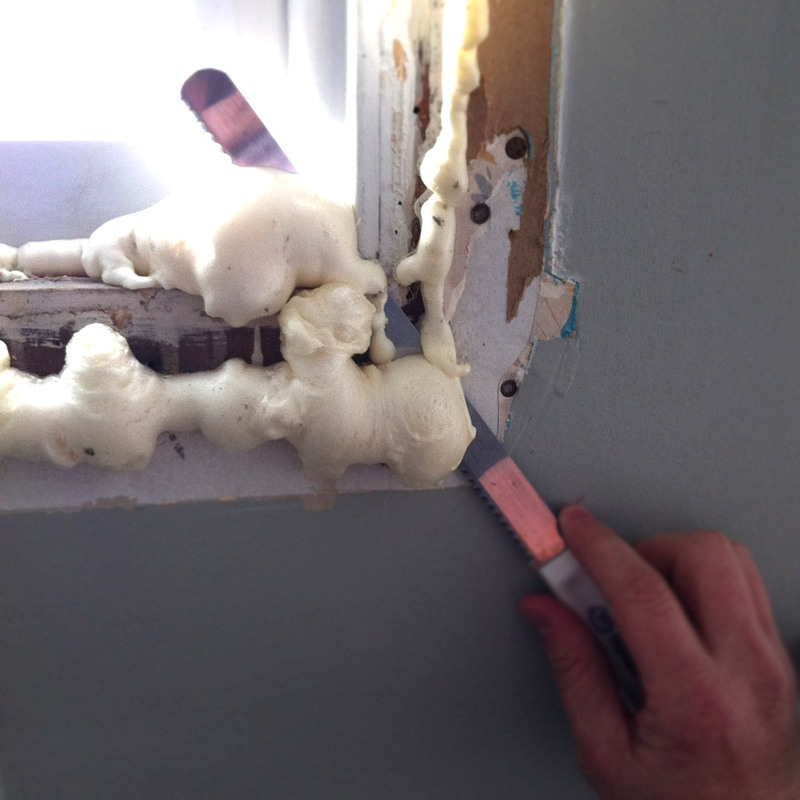 It’s how to cut spray foam insulation. 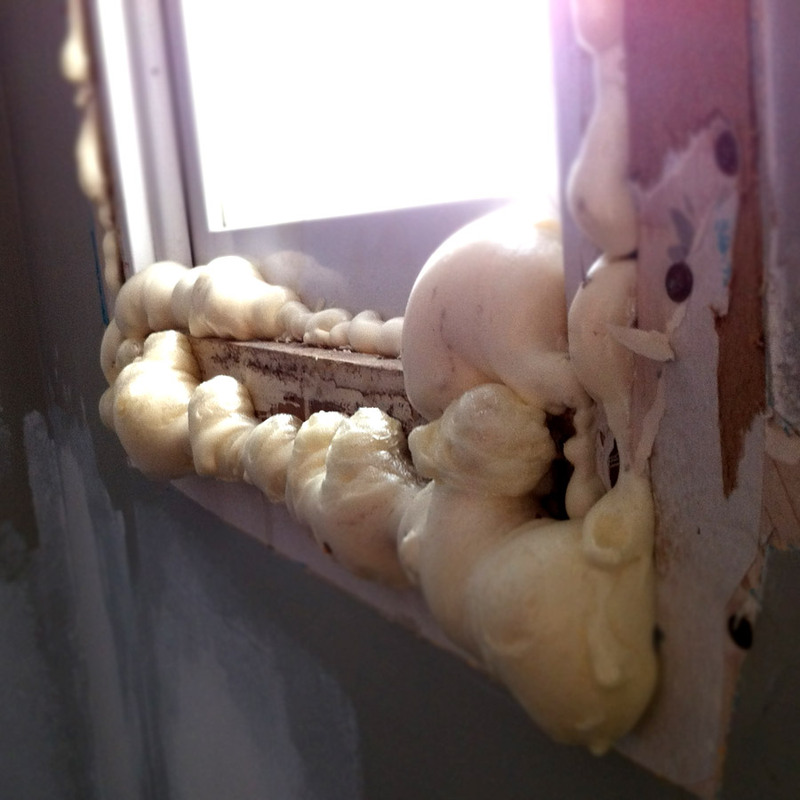 BACK STORY: Recently while helping Emily at merrypad.com redo her bathroom for DIY network we spray-foamed her bathroom window gaps because when we removed the old trim her bathroom was suddenly like Ooook-lahoma, where the wind comes sweepin’ down the plain. Anyone who uses this great stuff (see what I did there? If not, you’ve probably never used spray foam insulation) knows that you spray away, you don’t think you used that much, then you come back the next day and the area you sprayed looks something like this. PRO TIP: Before you break the seal on that can of spray foam, walk around your house and find all the places you can spray this stuff. Once you break the seal you better use it all, because it’s basically a one-time use thing. There’s no saving it for later. It hardens up and you just wasted a whole can. I once heard Adam Carolla compare a can of Great Stuff Foam to a beer. Once you open that sucker you chug it. You don’t put the cap back on it and save it for later. I’ve tried lots of ways to cut away excess foam. The most succesful up to now was my Husky utility knife with a brand new blade. And that works ok for small amounts of foam, but once you get past the depth of the blade you start having to hack at the foam and dig at it and the next thing you know you’ve got shredded up foam. First have a big breakfast meeting and have it catered by a bagel shop or someplace that will throw in a big old cheap, serrated bread knife. Next, use that sucker to saw the foam. Hold it as flat to the wall as possible and it’ll saw through the cured foam like nothing. And, that’s it. And yes, I could’ve probably written this post in one sentence. Or even just a tweet. Is there a better way of cutting this foam that I’m missing? 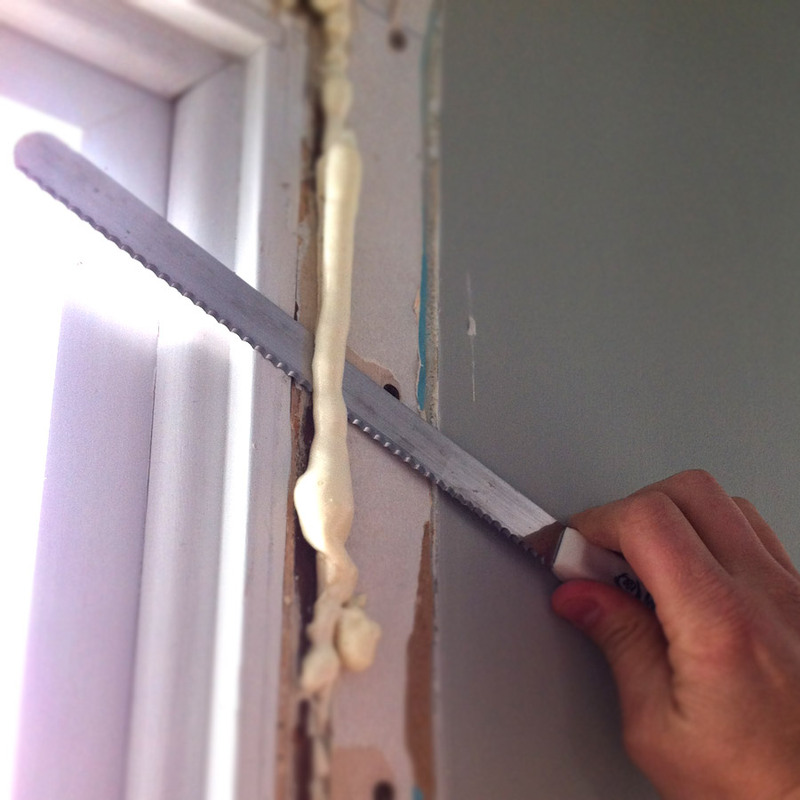 I’ve used a drywall saw, but the blade you have is much more flexible. Definitely the way to go. The serrated blade is key. I’ve never tried the drywall saw but I imagine that gets nasty. Serrated blades are great for cutting thick foam. If you are cutting 3 inches thick or less try an Olfa L-2 utility knife. (Get the heavy duty blades for more dense material) These work great on spray foam, board type insulation, soft foam (for tool/pelican cases) etc. Good clean accurate cuts. I have one at home, one in my truck and two at work (narrow and heavy duty setup) so I’m never without. Way to be prepared, Kirk. I usually just carry the Milwaukee Fastback™ Utility Knife with me at all times but I like the lightweight L-2 as well. Thanks, Mike. It wasn’t a new install and I was just using the end of a can and getting as much in as I could, but yes, I’m sure it could have been neater, but something tells me you work for FoamCoInc and go around different sites and spread your name around. Nope, I was just suggesting you. Hi Pete, thanks for the tip. I’ve got a big foamy mess in my renovated walkout basement and wanted to know after I saw the foam flush with a serrated knife, can I sand it to get it smooth? We are painting next. I’m not sure you’ll ever get it to where you can paint it and have it look how you want. You could maybe skim coat it with drywall compound or plaster to get it smooth. The bread knife you show/ mention looks just like the blades on an electric kitchen knife. I think I will try the electric knife and see if it works – with less effort. I use it to cut bread all the time. I am hoping it will make a quick job of triming the windows. Will it still keep out moisture and insects if i cut it like this? we used some on the outside of our house and i would like to trim it, but if that hard shell is necessary then that would defeat the purpose. It can be cut, trimmed, sanded, whatever and it still does what it needs to do. Great suggestions by all. I used Great Stuff for filling in a hole where paper wasp were. I used the Pest Block type and it really expanded, i never knew there are different types now. Glad I found these suggestions to trim the blob. I used a hacksaw blade that was laying around. a maintenance person used spray foam around a pipe in the bathroom near a toilet. How do I trim this down giving the small area to work in, the pipe protruding out of the foam monster and the fact that painted drywall is also consumed by the over foam monster…. hi. I have a ten floor joist, about 11 ft long that cracked in a project I’m on. It’s totally lathered in the spray foam. A more stubborn kind. Do you still maintain the bread knife being the best way to go? I have to cut on side of the joist’s/beam’s foam and remove as much as possible then tack up a support beam, same size to it. It’s all jacked up a ready to go and I was thinking about what to use exactly to cut through the foam. Some areas being four, five inches +. Thanks in advance for any suggestions. hi. I have an eleven ft floor joist that cracked in a project I’m on. It’s totally lathered in the spray foam. A more stubborn kind. 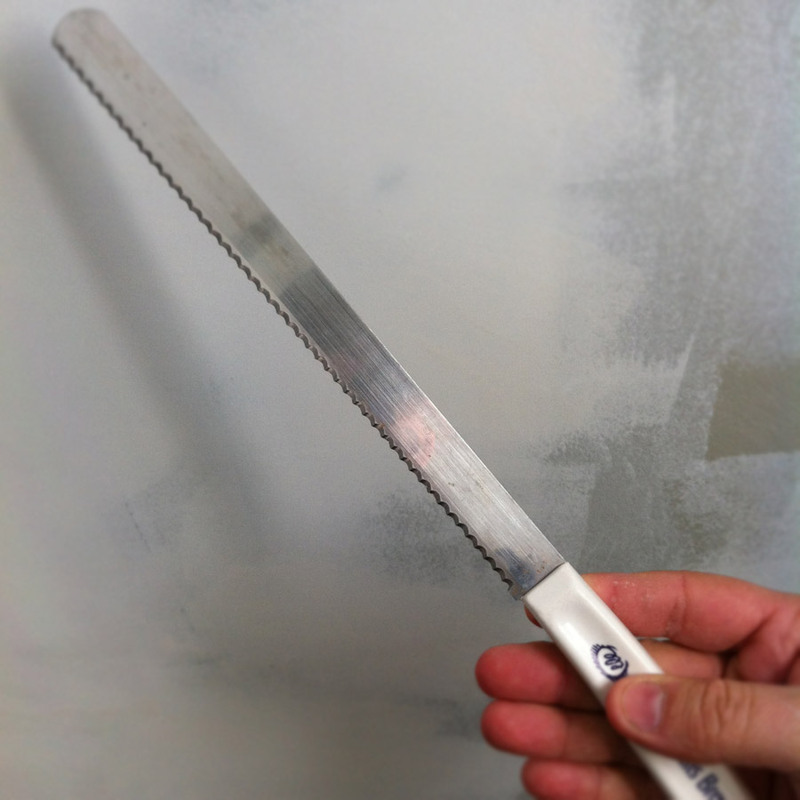 Do you still maintain the bread knife being the best way to go? I have to cut one side of the joist’s/beam’s foam away and remove as much as possible then tack up a support beam, same size. It’s all jacked up a ready to go and I was thinking about what to use exactly to cut through the foam. Some areas being four, five inches +. Thanks in advance for any suggestions. I’d go with whatever works best for you based on the application. In most of my experience I like the serrated knife. Guitar string works for large areas. Steel fishing line would work also. You can reuse a can. I just finished my second use. Just clean the nozzle and tube right away with Goof Off, drop by drop till the tube clears. The nozzle foam just melts with a drop. Hey guys, I just want to share my method of removing spray foam. I tried serrated blades, razor blades, blades of grass, shoulder blades, and all were not working as I needed them to, sooo, I went and grabbed my trusty machete, the blade is thin, strong and sharp, you can get under and behind the foam with ease,and pry with it just enough to pop the stuff off of there a piece at a time.